March is the mud month. 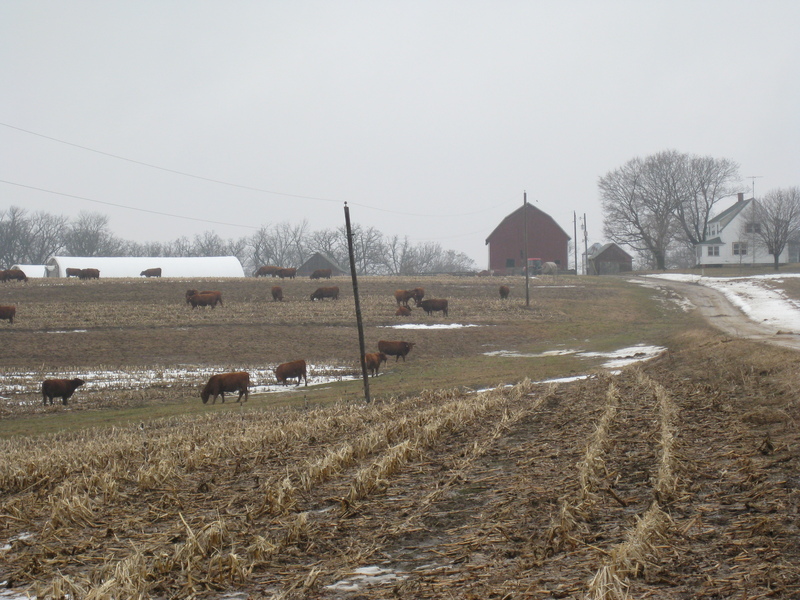 Pictured is our cowherd on their winter quarters. We had them down to Dad’s most of the winter. It was closer to the hay supply. But as the weather warmed they started to damage the hay strips with their hooves. We moved them to my contour strips which will be oats and no-till corn this year, so there is no hay ground to damage. I am worried about them damaging the waterway which is a grass sod, but I think it will take the abuse from their hooves and spring back eventually. Here is a picture of my contour strips last summer. We are buying time until the frost goes out of the ground and the soil dries up, hopefully by April. Because they will be moved into the calving pasture by April, regardless of conditions. And this brings me to my point. If you have animals year-around on your farm they always have to be somewhere. And some days, even months, are not much fun to farm with livestock. So if you are a beginning farmer here is my advice. Stick with seasonal production until you know exactly what you want to do. Broiler chickens, feeder pigs, lambs, calves, young cull cows, even year-old laying hens are all available in my area in the spring. Only purchase what can be marketed by fall and have everything gone by Thanksgiving or Christmas. And then you will enjoy beautiful down-time. Down-time is even more valuable when you’re trying to figure out what you want to do. This entry was posted on Thursday, March 11th, 2010 at 3:41 pm and is filed under Curious business. You can follow any responses to this entry through the RSS 2.0 feed. You can leave a response, or trackback from your own site.